That is the cutest fluffy sheep ever! Seriously love the sheep! I'm also looking forward to reading more about crewel work, since I've never done any. 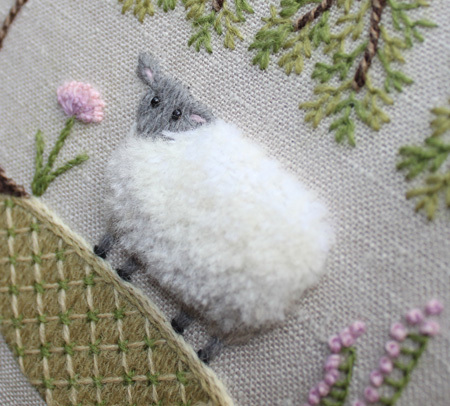 Awww this is gorgeous I love the fluffy sheep. I'd love to have a go at crewel work but wouldn't know where to start so any help instruction would be brilliant. What sort of fabric do you use and what sort of wool? ooo the sheep looks so soft and woolllllly....love it and what a beautiful octopus below...gorgeous colors. Oh, I think the turkey knots are absolutely perfect! I think the head looks perfect - great work! Ca-ute!! My fingers want to reach thru my computer's screen and feel the fluffiness of the sheep's wool :-). I know it's common to stitch the wool with french knots, which I like a lot, but I think I like the cut turkey work even better! This is gorgeous!! Is there any way we could get the pattern? I would just love to try my hand at this! !